So what exactly is a rag quilt anyway? A rag quilt has exposed seam allowances on the front of the quilt and finished seams on the back. It is usually made up from several pieces sewn together like a patchwork quilt. 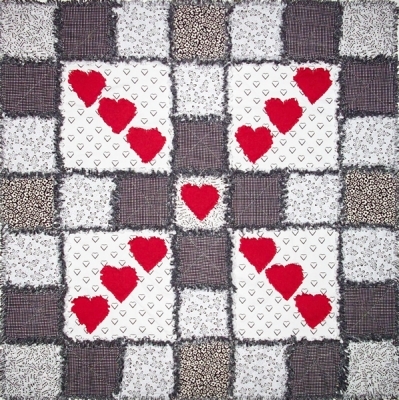 The raggedy hearts quilt shown above is a perfect way to use up some of your stash or simply use fabric with a theme. Rag quilts are generally very easy to sew and quick to assemble which make them perfect for beginners. Rag quilts don’t always have to be created from squares. 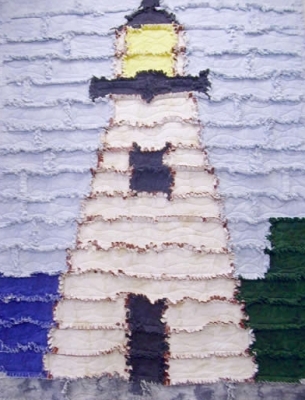 The Lighthouse Rag Quilt Pattern is created from strips with exposed seams. It is a good pattern for intermediate level quilters. The most popular fabrics to use for rag quilts are sturdy fabrics such as homespun, flannel and denim. Recycled blue jeans can be cut up and used to make squares for the quilt. Denim is sturdy and frays nicely. Try to choose fabric that has color on both sides since both sides of the fabric will show in the seams. Sometimes a bright white background may create a definite outline for each block. This could detract from or add to your quilt design. Cotton fabrics will fray better than polyester blends. For the back of the quilt use fabric that will complement your quilt. The backing will show through the seam allowances. If you have a light color on top and a dark color for the back, it may show through. AccuQuilt GO! has dies that are specially designed to create rag quilts and accessories. Both the Raggedy Stars Quilt Pattern (above) and the Rag Batik Satchel Pattern (below) were created with AccuQuilt GO! dies. Use a sharp, new needle that is designed to sew medium-weight woven fabric. Depending on the pattern, use a 1” or 1/2″ seam allowance to sew the blocks together. Use a 1/4″ seam allowance to piece patches within a block. Consider using flannel fabric for the batting for soft, cuddly rag quilts. Once your quilt is assembled, you will need to wash and dry it to get a nice fringed effect. Some quilters choose to take their quilts to the Laundromat the first time since this process can be hard on your machines. When washing, put the quilt in the washing machine, full cycle, with fabric softener and a bit of detergent. During the drying process, you will want to empty the lint trap several times while drying. Once fully dried, take the quilt outside and shake it to get rid of loose threads. Repeat the washing and drying cycle if needed. 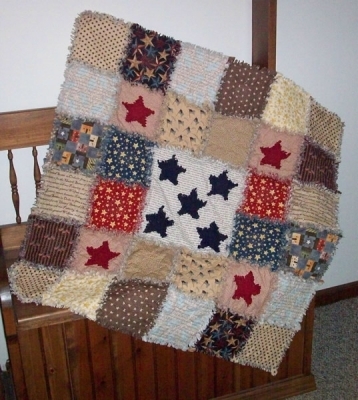 You will want your quilt to have that well worn, “loved” look. Wear clothing (avoid black) that repells lint. Have a roller lint remover ready to remove loose thread from certain areas of the quilt and from your clothing. Do you have tips for making rag quilts? We would love to hear them. 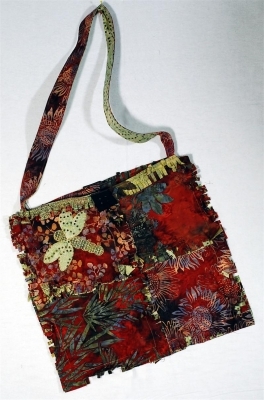 This entry was posted in AccuQuilt GO!, Fabric, patterns, QuiltWoman and tagged lighthouse rag quilt pattern, rag batik satchel pattern, rag quilt, rag quilting tips, raggedy hearts quilt pattern, raggedy stars quilt pattern. Bookmark the permalink. I used a vacuum to remove some of the lint from the quilt after drying. Rag quilts are very useful especially in the winter. Although rag quilts are for every season in winter you need few more for your home. You have explained all the necessary things about rag quilts such as the fabric, washing tips, how to make tips and I have noted all of these as I am planning to make 4 rag quilts for my bedroom. This post is definitely going to help me out. I would like to share another good link regarding quilting I found at http://www.warpandweft.ca/blog/.